This medium sized press is extremely versatile for every papermaking studio. The frame is steel, coated with rust-proof enamel paint. 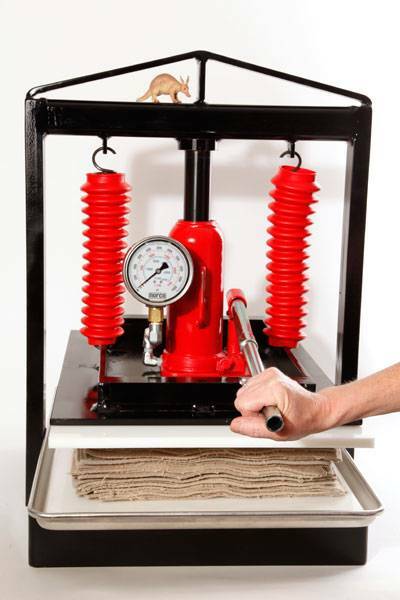 It has a 12-ton hydraulic jack with a high quality pressure gauge to give the user greater control, an aluminum drain tray, and two high density polyethylene boards, 16”x 24”. The upper platen is 3/8” steel, 16”x 23”. These presses have a 1/4” steel bottom platen to ensure even pressing. One can press paper with a width of up to 16” and any length, depending on the length of the pressboards. The Aardvark press is light enough to make it portable, and we take one to all our workshops outside the Carriage House. The press is shipped fully assembled, however it can be easily disassembled for easier portabillty.